Gad…what a can of worms this opens up. It’s a seemingly simple question. What to prime my house with? It’s cypress, ya see, except where it’s cedar, and probably sat with very little paint on it for a LOT of years. More recently (around a decade ago) it was painted white. Due to water intrusion there are issues with this paint in many areas, and due to incomplete preperation there are problems in others as well. It is, of course, flaking off to clean wood. 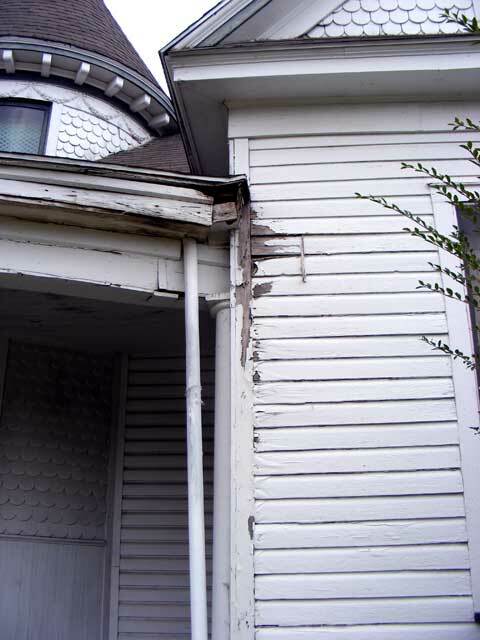 The worst place is where the porch eave is damaged, and the entire upper east dormer. It’s hard to resist, really, walking by a bad patch there is a nearly irresistible compulsion to just “flick” some off. It’s like popping bubble wrap, really. But I must resist, yes? I’m not ready to finish stripping and prime yet…of course, the flaking paint is actually doing very little to protect anything and could actually be making things worse by allowing some water in but not easy drying out. Ur…yah. Sorry. Seem to have digressed just a teensy bit. Used to be that you would strip the old paint off, coat with a linseed oil/turpentine mix, and then top that off with a good oil-based primer. After a few days a top coat of any quality paint of your choice. Me, I’d normally choose an acrylic latex or such. But, I’ve not done it in a while. Painting an old house is not like painting a new one. My 80’s tract home just needed washed down and coated with…well…pretty much anything. Maybe 5 gallons of paint was involved. It took me maybe 10 days of working an hour or two after work. Not a significant investment. Could have done it in a weekend…that is, if my job allowed weekends. The Old Vic…well, it’s a different story. There might be 50 or 100 gallons of paint and primer involved before it’s all said and done. Thousands of dollars. With the acrobatics necessary to reach and work on some parts of it…well, we’re talking about a lot of time and money. I really don’t want to have to do it over every couple years. And then there’s the base color. It’s a dark base. Always more critical that you get it right. Sun, heat, fading…yeah. So, I’ve been out of the game a bit…and felt I should ask/research. Can of worms = asploded! I’ve got a feeling paint and surface preparation methods have about as many opinions as there are people to ask. It’s a bit annoying…many of the “facts” that are presented are from the standpoint of political views (the “green” movement) or what products are carried, rather than performance. Well, yeah, I’m sure they have…but how do they stack up against the oil based ones? Consumer reports will tell me…maybe…for $69.95. Hard to tell, since I’d have to pay to find out if they even have a relevant article. And what of the linseed oil? Ask the pros? LOL! Yeah, right. The definition of “pro” is that they charge people for their work. Some of their paint jobs have lasted 3 whole years! There’s articles on the ‘net. Mostly they start with the same question I have..IE, “What works the best?”, and then degenerate into “Oil bad.” “Solvent bad.” “Gonna be banned soon.” “Die in a fire!” Yada yada. Maybe “oil bad”, but there’s solvents in latex based paints as well…and is priming my house once every generation or so with oil really worse than a complete strip and redo every 5 years? Performance. What holds? What works? The Behr paint guy (the 68 year old retired plumber at Home Depot who’s never painted in his life) actually stated that since it was a wood house, It didn’t matter what I used. I’d just have to keep repainting it every 3 years. Hmmm…$5000 worth of paint…every three years…divided by 36…carry the two…that’s a continued monthly expense that’s higher than my utility bills. I wonder if I should just set up an automatic banking deduction? The Behr website is cute and flashy and slow and difficult to navigate…and while it does have information about their oil-based primer…it does not recommend a prep routine for the best performance of its own products. Oh, and pretty much no matter what I do it keeps putting me back on the screen about how they are top rated by JD Powers and Associates. Hmmm. Great. When I want to paint my car, I’ll look you up (just try searching for “exterior house paint” on JD Power). The Valspar and Olympic sites were even worse…with no word at all about primer or best prep. Finally I went by the Sherwin Williams store, and they were quite helpful…best information I’ve been able to get anyway. Since they make (and STOCK) both oil and latex based primers, I figured maybe they would have information about which should be used and why. Hands down, they recommended the oil based primer for the bare or nearly bare wood, regardless if I used their topcoat or not. “Why the latex primers then?” I asked. They indicated those were for particular customer preference, places where the oil was prohibited, and climates where the houses were protected from the weather by “Mysterious flying unicorns farting rainbows”. The latex primers would provide acceptable performance, but the oil based ones are recommended for my situation. A hint showed that they were actually competent when I asked about tinting the primer (our base color choice is quite dark) and they knew exactly how dark they could get it, (and above that, can match exactly if you like). The Lowes and Home Depot folks, when asked about tinting primer, all asked me, “Why would you want to do that?” It got even more comical when they all got together and tried to figure out how to make their computer do it (Home Depot had 1 gallon of oil based primer in stock, I was needing it as I was starting on a window sash, which will be black or nearly so when done). I still haven’t found any useful information about first priming with linseed oil and turpentine mix. Helps? Hinders? Waste of time and money? Ruins the primer? Makes it stick better? Decisions have to be soon. This weekend I’ll be repairing the significantly damaged eave…so priming is required…may as well start with the final, desired color top coat as well…painting can be a process I guess. So, at this point…it looks like I’m gonna hit the Sherwin Williams system…oil based primer with their (very expensive) topcoat. A good Oil primer is your best bet for old, weathered, dried out wood like yours (never messed with linseed oil or turpentine. My guess is there is no benefit to that step. Had a commercial Benjamin Moore rep. come out and consult on a 100 year old set of barns I painted a few years back and that was his recommendation. Be sure you have clean wood first. Hit it with a scraper, wirebrush, sander, etc. and then scrub it down if at all possible. If you have a chalky or dusty finish the primer WILL peel. I would recommend priming everything if you have the time. The painted areas will not take nearly as much primer as the bare wood and since you are dealing with very old paint a coat of primer will help guarantee good adhesion. Before you drop big money on paint ask the SW store if you can open an account and get a contractor’s discount. Have fun! I painted houses for 10 years and had good fun doing it. Make sure you don’t completely seal up the siding when you paint. It is good to caulk the Trim-siding corners but you want an air gap at the bottom of the siding boards (don’t completely gum it up with paint). If you don’t do this moisture does not have any way to migrate out through the siding and your new coat of paint may simply get baked and bubbled off the side of the house (DAMHIKT). If necessary you can run a scraper under the boards to ensure a little gap. If you are tempted to blow the paint off with a pressure washer be very careful. Under no circumstances wash with the nozzle pointed up (this will force water under the siding and allow ample time for the moisture to dissipate before priming. Heavy duty razor scrapers will be your best bet for removing loose paint and a wash with TSP (use a brush and rinse well) will eliminate chalk and etch the surface of the old paint. Two warnings: if you mix it too strongly and let it sit too long it may etch your windows and eat your aluminum ladders but you will have very nice paint.